This is a French cookbook from about 1900. The title is ‘La Cuisiniere des Menages’, which translates to ‘The Cooker Cook of the House. It is a great little book, 536 pages including the index. 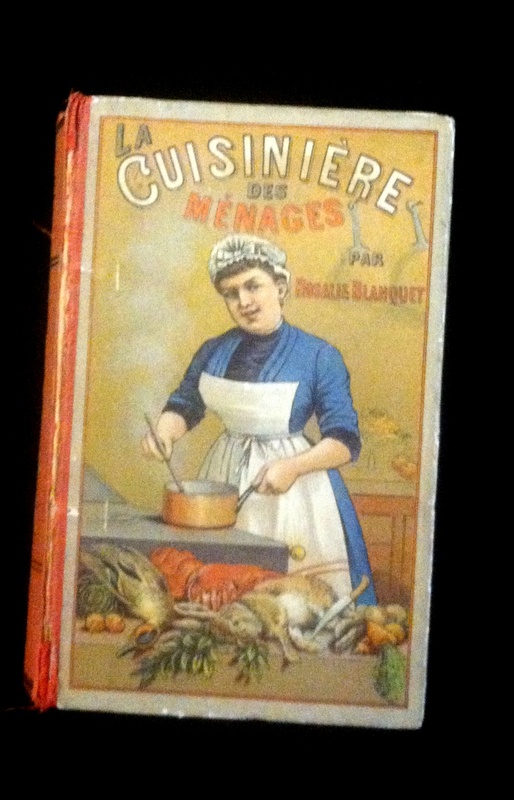 I am not very good with French, but this book is the whole method (1900’s style) of French cookery. It starts with kitchen terms, then goes into tools, butchering and then cooking. I will probably have to start learning some French now! The book does need a little repair at the front hinge, just some cloth to hold the hinge together. Not a big deal, more of a conservation item than an actual repair. Anyhow, here is the cover of the book. I may redraw this so I can print it out larger. Let me know what you think. This entry was posted in Antiquarian Books and Ephemera, Food and Cooking and tagged Antiquarian, beef, Book Arts, Book Restoration, Books, braising, Collecting, crafts, diced onions, Rare Books, Restoration. Bookmark the permalink.